Firstly, apologies for the tardiness of this update. Things got a little hectic and it slipped my mind. Last week was certainly busy! This is what we intended to be tech week, which has now become a kind of tech week-and-a-half (as these things are wont to do). But what fantastic progress was made! The set is nearly complete aside from some detail work; most of the costumes are complete; there are lighting, projection, and sound cues written (though we still need to work through them); and front of house is starting to take shape. The rehearsal schedule went a bit sideways this week. Monday we had a run (run time was still at 2 hours 21 minutes, without intermission). The assistant light designers were on hand to watch and begin formulating a plan for cues. Flying projector. Photo by Tiffany Michael. Tuesday and Wednesday were reserved for filming projection material and dry tech. (Dry tech is where we work through all the technical elements of a show without actors.) Three sessions later, we had enough material to begin putting together the projection cues. Tuesday night, problems began creeping up. The system we're using to create and play back sounds wasn't working right. So Tuesday evening was spent tracking down solutions. Luckily, when we tried several of them on Wednesday, the system worked great! Which led us to the projector problems. When we fed the projection cues to the projector, we discovered it just was too far back. We had to somehow mount it about 9 feet closer. 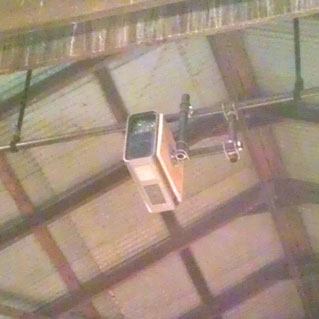 This effectively put the projector hanging out in the middle of open air. Ian and I put our heads together, came up with a plan, found the parts, ran it by Steven and Robert, and successfully got the projector in a much better location. We even took the opportunity to turn it sideways since we need a tall projection space more than we need a wide one. It all worked out, though it did put us behind. The actors met in town Wednesday night to run lines while we were out fighting with the sound and projector. When the actors joined us on Thursday, we had to shift plans around. Thursday and Friday were supposed to be wet tech days (run through the technical elements, this time with actors). Instead, the actors ran the show outside with Jenny (it's down to about 2 hours) while inside cues were being written and problems solved. Maddy came back from Montana on Friday and was able to spend a significant time after the run going over notes with the actors. Over the weekend, the set crew made tremendous progress getting walls and doors up. Gena Whitman (the set designer) came in to paint. Most of the living room space is now painted, and there's only a few areas that need some detail work, for the most part. Otherwise, we have a fantastic, nearly-complete set! Maddie Stone as Psyche, Josh van Eyken as Eros. Sunday morning a crew went out to the barn to clean up a bit. Items that were no longer needed were taken away. The backstage space was organized a bit more. And the parking area was set up. We had to shoot one more session of filming on Sunday night (which is what I was doing instead of writing this update on time). This week we'll be actually working with actors and the technical elements, plus we're adding in costumes. We'll have dress rehearsals (basically performances without an audience) later in the week, then on Friday, we open! So exciting! 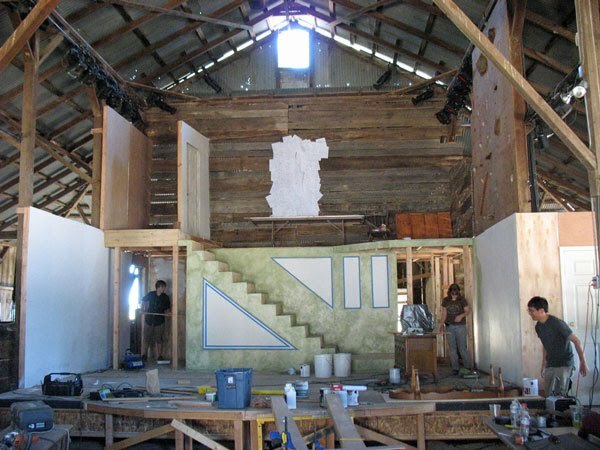 Set Construction. Photo by Robert Schulz.